"Of all the tragic losses since the 1960s, mimeograph paper may be the greatest. With its rapturously fragrant, sweetly aromatic pale blue ink, mimeograph paper was literally intoxicating. 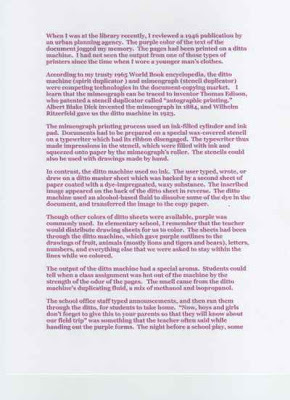 Two deep drafts of a freshly run-off mimeograph worksheet and I would be the education system’s willing slave for up to seven hours."